BET has added Eve and In the House to its schedule featuring rappers Eve and LL Cool J. The sitcoms join the BET morning block of sitcoms from 8am-12pm, with Martin on Mondays, House of Payne on Tuesdays, Fresh Prince on Wednesdays, Eve on Thursdays and In the House on Fridays. Eventually the two new additions will air on most weeknights from 6-8pm, too, with an hour of each show. Eve and In the House will also air in late night blocks with The Jamie Foxx Show and The Game beginning at 2am. Eve starred Eve, Jason George, Ali Landry, Natalie Desselle-Reid, Brian Hooks, and Sean Maguire. It aired on the UPN from 2003-2006, with 66 episodes. 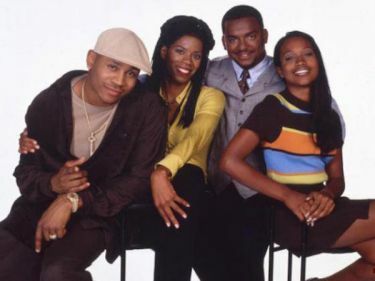 In the House starred LL Cool J, Maia Campbell, Debbie Allen, Kim Wayans, and Alfonso Ribeiro. It aired on NBC from 1995-96, before moving to UPN from 1996-1999. Keep it right here for continued updates. HBO released a teaser photo, trailer and their Facebook page today for the upcoming comedy Divorce. The half-hour comedy series Divorce(ten episodes) stars Sarah Jessica Parker, who also serves as an executive producer, as Frances, a woman who suddenly begins to reassess her life and her marriage, and finds that making a clean break and a fresh start is harder than she thought. The show also stars Thomas Haden Church, Molly Shannon, Talia Balsam, Tracy Letts, Sterling Jerins and Charlie Kilgore. Pilot episode written by Sharon Horgan; directed by Jesse Peretz. Series created by Sharon Horgan; executive produced by Paul Simms, Sarah Jessica Parker, Sharon Horgan, Alison Benson and Aaron Kaplan.